I love to read....I am part of an informal book club on FB...a member of GoodReads.com...and I love book discussions. I got a kindle for my birthday last year and I think it is awesome! I don't know that I have a particular genre that I like to read. I like memoirs, I like popular fiction novels, I like some of the classics, I like reading fantasy and science fiction, and I even have a long list of recently read young adult books. The only young adult series I haven't read that everyone else seems to have read is the Twilight series and the Harry Potter series! Some of my recent favorites have been The Glass Castle by Jeanette Walls, The Girl with the Dragon Tattoo by Stieg Larsson, and The White Mary by Kira Salak (I almost picked this book as my inspiration...). I am currently reading The second book in the Game of Thrones series. When I saw Erin's challenge of a Challenge of Literature, an idea popped into my head immediately. As I mentioned earlier I like young adult books! I loved the City of Ember Series by Jean DuPrau, also loved Susan Beth Pfeffer's Life As We Knew It (The Last Survivors) series. And last year, I was engrossed with The Hunger Games series by Suzanne Collins! It is an exciting, adventurous series. A page-turner with a terrific heroine. It's full of wonderful themes about class and society; power; love; sacrifice; family and more! 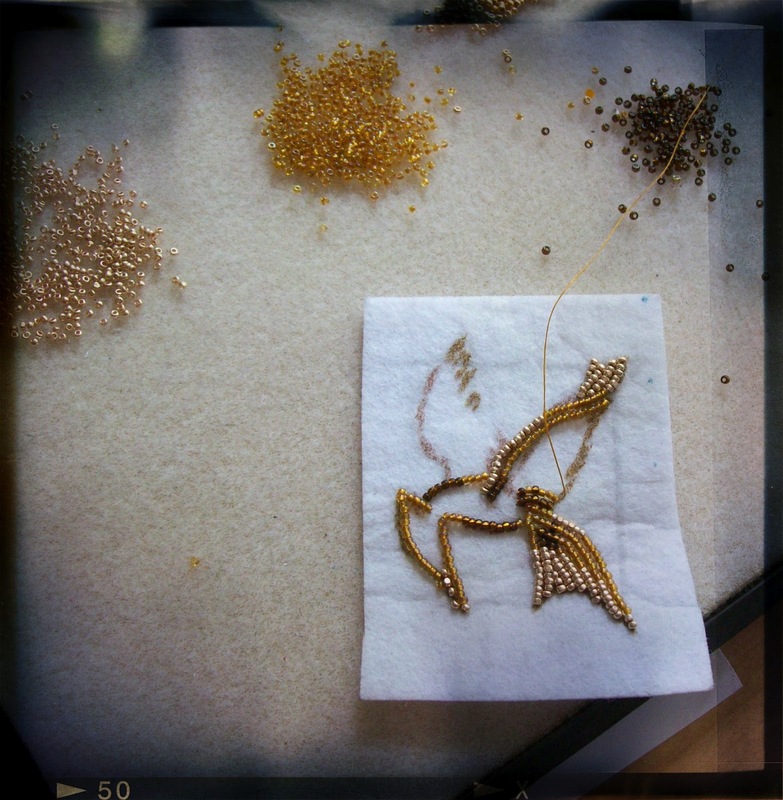 For my Challenge of Literature reveal, I present my version of the mockingjay pin! The arrow needs some work - but I didn't have a chance to get the gold wire I wanted in time, so I improvised with what I had! I really enjoyed reading all three books of The Hunger Games. I missed Ms. Katniss when I completed the series! When I look at my list of favorite books I do see a trend of what I like!!! I love what you did with these components, Amy! They work so well together. OMG AMY!!! This is truly amazing! I can see how much you love the reading and can totally put that love into beads! A gorgeous work of art you have made here! The mocking jay is awesome! Love the Hunger Games! Great series! Super beading work! Love the bracelet! OMG so so cool!!! Love this - I love to read and can't recommend Harry Potter enough - It is a male version ( well a much better written/ darker version male version) of Cinderella. Seriously you'll love it. Twilight was ok - a little "teenagerish" for me and having kids didn't love the message the relationship sends but a fun read. What a gorgeous pin! Your beading skills are outstanding. I've never read the Hunger Games series, but all three of my children love them. This is great! I love the mockingjay pin. Really awesome work and you captured it perfectly. I read the books and loved them (although I really wanted to NOT love them - ha). Giiirrrlll(as we say in the south) I love that pin it is gorgeous! You did a knock out job of recreating the Mockingjay. I'm so in awe of your beading skills! I have not read this series, but it is on my list. I love Goodreads, too, and your Mockingjay even more. Great timing on that choice and execution on the beady version. LOVE your pin!!! How beautiful! You have mad seed bead skills!!! That's just beautiful - I am in awe of your ability to work with tiny beads - in my house they head straight for the floor! I can see how much work went into this piece, it's beautiful! oh Amy this is wonderful!! 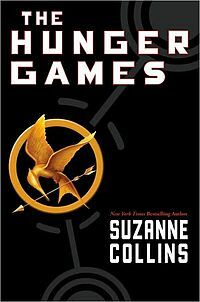 I read the Hunger Games Trilogy recently and found I just couldnt put them down! When I first read the description of the first book I almost passed it by. I had heard from so many people how good the books were so I went ahead and got the first one. I was hooked immediatley. You created a perfect piece to represent your book of choice. well done so ingricate and delicate. Agreed! THe Hunger Games trilogy was powerful and captivating. I admire your seed bead work! Wow! So nicely done. I haven't read the Hunger games myself but I have three 15 year old nieces who would probably battle it out for this. Great job! Oh, wow - this is gorgeous! Your work is just beautiful, some talent there! Patience, too, right? Great idea that you have presented! I loved the books and I think they did a great job on the first movie. I do love your Mockingjay pin, it's beautiful. Thanks for sharing different series of books - always looking for a new good read! I think you did a wonderful job with your pin!!! This pin is awesome! Seed beads scare me. People who can make such beautiful creations with them leave me in awe! Fantastic pin (all those seedies!)! I haven't read these books yet but they're sitting in my reading pile. You sound like you have as eclectic tastes in books as me! I do recommend the Harry Potter books, and the Twilight ones are a fun read -- reminded me of those absolutely teenaged feelings of longing and lust and love LOL. Follow my literature blog. And please be critical. p.s. Love the mockingbird Pin. Oh goodness, Amy! That mockingjay is incredible! You have serious skills, miss! I think you and I have some similar tastes and I too miss Katniss now that I've finished the series. If you ever want to chat about it, feel free to send me an email!